The relation between the One and the Multiplicity is the most enigmatic issue in metaphysical research. 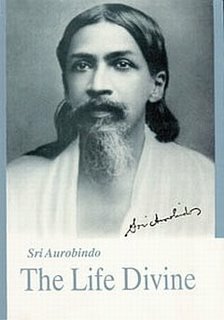 Sri Aurobindo bridged the gap between the One and the Many by positing the presence of a Supreme Creative Consciousness holding pre-programmed creative ideas that get projected to create the worlds. This creation needs to follow a trajectory so that there is harmony instead of chaos, a trajectory that is in accordance with a Divine Law. The Divine Law has the onerous task of relating the Oneness (the subject of True Knowledge) with the multiplicity (that being ignorant of the unitary origin represents Ignorance) without losing the truth of an integral harmony. The Divine Law also known as the Higher Maya or divine Maya must be executed by a status of consciousness that frames the illimitable into a mosaic of limits facilitating meaningful interchange and interaction to manifest a harmony among diversities and the incipient presence of oneness in the matrix of a diversified multiplicity. This subordinate principle of delimitation, subordinate to the Supermind is the DIVINE MIND (The Life Divine, pg 177). What exactly does the Divine Mind do? (a) The consciousness of oneness which is ‘originative and cognisant’ and possesses the multiplicity that is decreed yet unmanifest watches itself and sanctions itself to produce the ‘active and formative’ consciousness that manifests the multiplicity while maintaining an integralism – ‘somewhat as a poet views the creations of his own consciousness placed before him in it as if they were things other than the creator and his creative force, yet all the time they are really no more than the play of self-formation of his own being in itself and are indivisible there from their creator’ (Ibid). (b)	The consciousness of oneness that holds the multiplicity detaches itself from the consciousness which manifests multiplicity without losing the link with oneness. Thus is born ‘the fundamental division which leads to all the rest, the division of the Purusha, the conscious soul who knows and sees and by his own vision creates and ordains, and the Prakriti, the Force-Soul or Nature-soul which is his knowledge and his vision, his creation and his all-ordaining power. Both are one Being, one Existence, and the forms seen and created are multiple forms of that Being which are placed by Him as Knowledge before Himself as Knower, as force before Himself as Creator’ (Ibid, pg 177-178). (c)	The last action of this apprehending consciousness takes place when the Purusha pervading the conscious extension of his being, present at every point of itself as well as in his totality, inhabiting every form, regards the whole as if separately, from each of the stand-points he has taken; he views and governs the relations of each soul-form of himself with other soul-forms from the standpoint of will and knowledge appropriate to each particular form’ (Ibid, pg 178). At the level of what we ordinarily know as human cognition, the multiplicity observes itself from the poise of multiplicity oblivious of the concealed oneness and in exclusion of all true sense of the infinite. This helps the Mind to chart out an exclusive path of action (svadharma) for each prototypal nature (Svabhava); an exclusivity that can be maintained by cutting off contact with the unity and oneness of the Supreme Creative Consciousness. Yet without this exclusivity, the creation could not be a sporting ground for unique integers. The world created by the Mind represents Ignorance because it has lost contact with the integrality of the all-pervading consciousness. The exclusivity is ordained and decreed as otherwise we would not have a world where unique integers could develop themselves to the highest possible potential. The exclusivity is a limitation that has to be worked through to re-establish the link with the unitary consciousness. The Mind is thus ‘the nodus of the Great Ignorance’ (Ibid, pg 176) and mistakenly thought to be the cause of the universe or a determinant of the divine Maya.